The Society for Creative Anachronism is an international organization dedicated to researching and re-creating the arts and skills of pre-17th- century Asia and Europe. Our “Known World” consists of 20 kingdoms, with over 30,000 members residing in countries around the world. 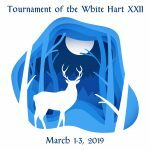 Members, dressed in clothing of the Middle Ages and Renaissance, attend events which feature tournaments, royal courts, feasts, dancing, various classes & workshops, and more. The Shire of Port Oasis humbly welcomes you to our humble land! We invite you to come join us in participating in our monthly All-things and Friday Night Socials, where you can meet the love this land. Come participate in our many medieval activities like fencing, heavy fighting, and the arts and sciences. We foster learning and we would love for you to come join us, learn something new and join a family forty-five thousand strong and growing.